Cheese, regardless of its kind, can be addictive. Why not? It is tasty, it goes well with almost anything, and it provides you the calcium and protein you need. Understandably, everyone – not only cheese connoisseurs – has their own favorite type of cheese. Some like it simple, like Cheddar. Many like it stretchy, like mozzarella. Then others like it complex, like blue cheese or Roquefort. Everybody has heard about mozzarella and Cheddar, but not everyone has tasted blue cheese and Roquefort. Are they the same? This article will focus on the difference between the two. Blue cheese is actually a broad category of cheese. It is called “blue” because of the distinct blue or blue-green veins (that are actually spots of mold) it contains. The blue spots appear after a process wherein Penicillium (a type of mold) is purposely added to it. The cheese is then aged in a temperature-monitored setting (i.e. a cave). Cheese in this category can be made from sheep, cow, or even goat’s milk and are made in different places. Some have rinds while others do not. Some are soft while others are crumbly. The taste can also range from salty to sour. However, all have one common denominator: all types of blue cheese have a distinct odor (similar to that of a foot odor). On the other hand, Roquefort is one of the many kinds of blue cheese. It got its name from Penecillium Roqueforte, the specific mold intentionally added to it which is found in caves. This cheese comes from a tiny town in southern France and is made especially with Laucaune sheep’s milk. Originally, locals would leave bread in caves for a long time until it was devoured by the mold. They would then dry and pulverize the mold and use it for the cheese. 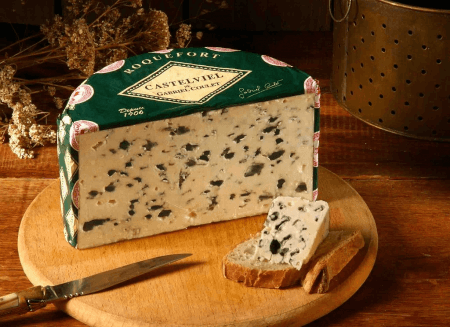 Nowadays, the mold can simply be cultured in a lab and then injected into cheese to produce Roquefort. 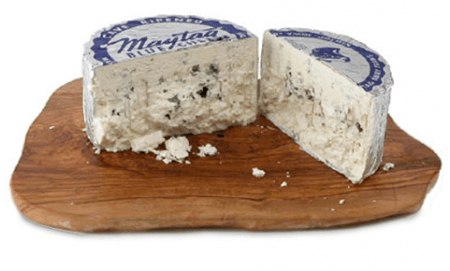 Roquefort cheese, like any other blue cheese, is white with streaks of blue or blue-green mold. It has a very strong odor, has a moist texture and is easy to break into tiny bits. Its salty, tangy taste and crumbly texture make it a famous option for dressings and salads. What, then, is the difference between blue cheese and Roquefort? Blue cheese is a broad category of different kinds of cheese that are white with blue or blue-green streaks in them. It has many varieties ranging from soft to crumbly and from salty to sour. On the other hand, Roquefort is one of the many kinds of blue cheese. It is specifically made by injecting Penicillium Roqueforte into it. It is made with the milk of Laucaune sheep from southern France. In conclusion, Roquefort cheese is blue cheese but not all blue cheeses are Roquefort cheese.